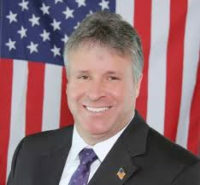 Mayor Jimmy Davis announced that he is co-sponsoring a health fair with Bayonne Medical Center on Tuesday, April 24, from 11:00 a.m. to 3:00 p.m. The health fair will take place in the Council Chambers in City Hall at 630 Avenue C, which is located between 27th and 28th Streets. The fair will include free health screenings, health education, and assistance with health insurance. The free health screenings will cover cholesterol; blood pressure; breast examinations; A1C/blood glucose; and peripheral arterial disease. Health education programs will cover diet and nutrition; stroke prevention education and screening; and general health. Doctors will participate in the health fair, and will be on hand to answer questions and administer health screenings. 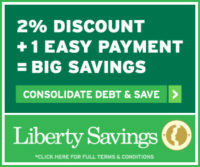 Assistance with questions and answers about health insurance will be available. Proclamation honoring Alexa Noone, Miss New Jersey USA 2018: Mayor Jimmy Davis presented a proclamation honoring Bayonne resident Alexa Noone, who was crowned recently as Miss New Jersey USA 2018. She will be making appearances at various state and local events during the coming year. Pictured left to right: Council Member At-Large Juan Perez, Second Ward Council Member Sal Gullace, Alexa Noone, and Mayor Davis. Alexa Noone Miss New Jersey 2017Alexa Noone receives proclamation from Bayonne Mayor Jimmy DavisBayonne Mayor Jimmy DavisBest Buddies Organization in New York CityBrigham Young UniversityCity of BayonneMiss New Jersey USA 2018Miss New Jersey USA.Miss USA 2018Prader-Willi SyndromeSimi Valley High School in CaliforniaUnited AirlinesWho is Miss New Jersey for 2018? Mayor Jimmy Davis and Library Director Sneh Bains announced that the Bayonne Public Library has purchased four passes for free admission to the Frick Collection, located at 1 East 70th Street in Manhattan. The Frick Collection is an internationally recognized art museum known for its distinguished Old Master paintings, such as those by Rembrandt, Bellini, Vermeer, and Goya, as well as outstanding examples of European sculpture and decorative arts. Library patrons may borrow the passes for a period of two nights. You must be a current Bayonne resident with a Bayonne Public Library card in good standing to borrow the passes. Access to the passes will be on a first-come first-served basis, and is subject to availability. For more information about the passes, please call the Library’s Reference Department at 201-858-6980. For more information about the Frick Collection, including museum hours, please visit www.frick.org, or call 212-288-0070. Please note that children under 10 are not admitted to the museum. Mayor Jimmy Davis announced that the Bayonne Public Library is offering a series of nine free summer movies on most Wednesdays through August 16 at 1:00 p.m. in the O’Connor Gallery on the second floor of the library. The building is located at 31st Street and Avenue C. There will be no film shown on Wednesday, July 5, since that date is during the July 4 holiday period. The films to be shown include award winners and nominees, plus a selection of children’s movies that are not just for kids. The films intended primarily for children will be shown July 26 through August 16. Youngsters attending the children’s films must be accompanied by an adult. No children will be admitted for the adult selections. July 12: La La Land. Rating: PG-13. Running time: 2hrs. 8 minutes. July 19: Fences. Rating: PG-13. Running time: 2 hrs. 19 minutes. July 26: Beauty and The Beast. Rating: PG. Running time: 2 hrs. 9 minutes. August 2: Trolls. Rating: PG. Running time: 1 hr. 32 minutes. August 9: Boss Baby. Rating: PG. Running time: 1 hr. 37 minutes. August 16: Sing. Rating: PG. Running time: 1 hr. 48 minutes. Young Frankenstein is being shown as a tribute to Gene Wilder, who plays Dr. Frankenstein in the film. Singing in the Rain is being presented as a tribute to Debbie Reynolds, who plays Cathy Selden in the movie. Wilder and Reynolds both passed away in 2016. 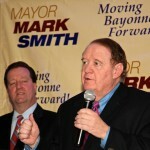 Bayonne Mayor Jimmy Davis. Free Movies at Bayonne Library this summer 2017City of BayonneFree Summer Movies in BayonneSummer MoviesWhat movies are playing at the Bayonne Library ? 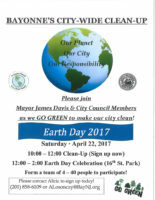 Mayor Davis’ upcoming Earth Day Event Saturday, April 22nd from 12:00 – 2:00 pm. This community event combines a citywide clean-up and fun celebration for all to enjoy. 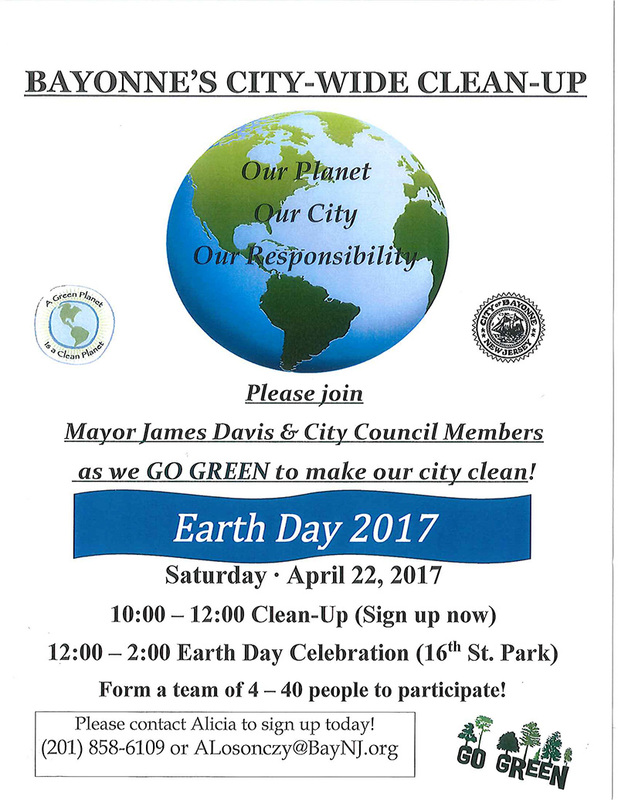 Over FORTY teams have signed up for the citywide clean-up. The Celebration, which will occur at 16th Street Park, off Avenue A will include hot dogs, ice cream, refreshments, a blow-up slide, and a band for all to enjoy. Also several organizations have agreed to host a table to offer environmental educational material and giveaways. 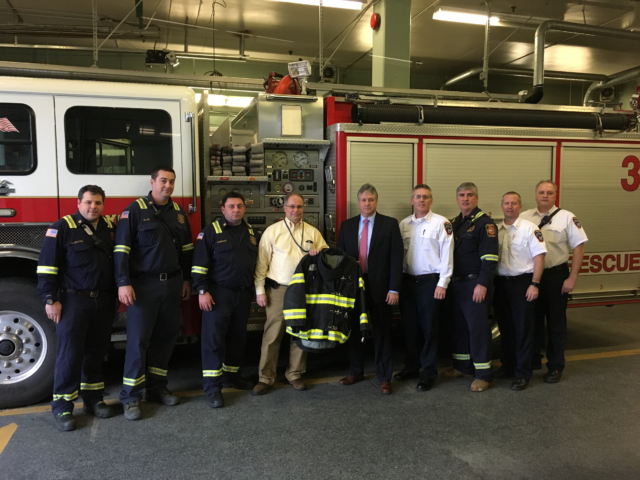 Mayor Jimmy Davis and Bayonne Fire Chief Keith Weaver announced that that City accepted the donation of 11 sets of firefighter turnout gear from IMTT. Representatives of IMTT including Terminal Manager Michael Morganti presented Mayor Davis, Fire Chief Keith Weaver, and Deputy Fire Chiefs Stephen Peterson and William Bartos with turnout gear valued at nearly $30,000. 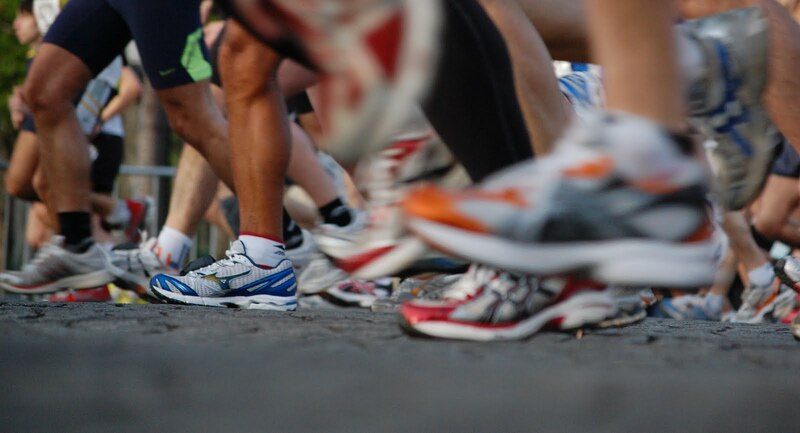 The City of Bayonne and Bayonne Department of Recreation will hold its 1st Annual “Bayonne 5K” and “Mayors Mile” on Saturday May 6, 2015 starting at 8:00 AM at the 16th Street Park in Bayonne, NJ. There will also be a 1 mile “Fun Run” that participants are encouraged to participate in as well. Participants of all ages and running levels are encouraged to come out and run (or walk!) Over 200 participants are expected. 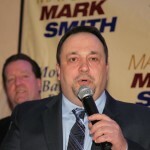 (Bayonne) The Bayonne City Council recently approved a request by the Administration of Mayor Mark Smith to authorize a redevelopment study of the southern portion of a city block bounded by East 21st Street, Broadway and Library Court. The redevelopment study is a pre-cursor to designating the area as “an area in need of redevelopment” which would permit the city to use all available redevelopment tools to spur redevelopment of the area. Included in the study area is a vacant parcel of land that was the site of a proposed movie theater but has been a vacant construction site for many years. 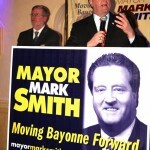 On Wednesday, February 12th Mayor Mark Smith of Bayonne and supporters gathered at the Chandelier Restaurant to kick off Smith’s 2014 run for Mayor. 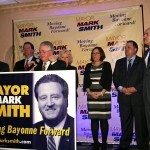 With the threat of a major snow storm looming an enthusiastic crowd of supporters were on hand to hear Mayor Smith announce his 2014 Council running mates which did not change from his current administration and to hear Former NJ Governor Richard Codey speak of the accomplishments of Mayor Smith’s current administration and the promise to “Move Bayonne Forward” for the next four years.